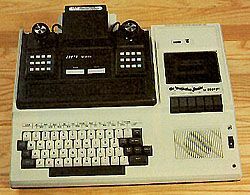 A hybrid computer, combining an APF 1000 video game system with a separate MPA 10 keyboard module. It came with 8K of RAM and 10K of ROM and could be expanded to 16K RAM, color grahics and a built in cassette recorder. The cassette mixed an audio track with the data track so as you were loading, a pre-recorded voice would tell you about the program. Email me if you have one collecting dust. APF Page - Includes link to emulator.